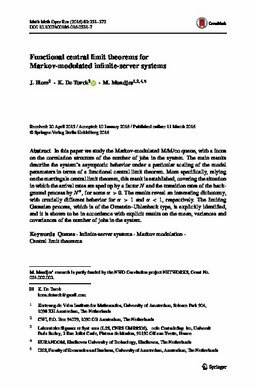 In this paper we study the Markov-modulated M/M/$\infty$ queue, with a focus on the correlation structure of the number of jobs in the system. The main results describe the system's asymptotic behavior under a particular scaling of the model parameters in terms of a functional central limit theorem. More specifically, relying on the martingale central limit theorem, this result is established, covering the situation in which the arrival rates are sped up by a factor $N$ and the transition rates of the background process by $N^\alpha$, for some $\alpha>0$. The results reveal an interesting dichotomy, with crucially different behavior for $\alpha>1$ and $\alpha<1$, respectively. The limiting Gaussian process, which is of the Ornstein-Uhlenbeck type, is explicitly identified, and it is shown to be in accordance with explicit results on the mean, variances and covariances of the number of jobs in the system.